Believe it or not, it has been two months in Alaska. I can attest that time flies when you run into surprises each and every day. The beauty both new and repeat of the Last Frontier is evident on my every hike, pedal, paddle, stroll, or float. Although, it is August, typically a month of hot summer days at the beach and bbqs in the rest of the lower 48. Here in Alaska, I’m in my rain gear, wearing layers, and experiencing changing weather conditions by the minute. It is a different type of summer for me, but I see the local Juneauites taking advantage of the season. All are out exploring the trails, fishing for salmon, and out on the water. As I believe in joining the locals, I too have gone to the water. 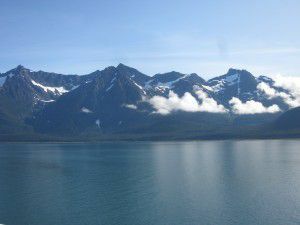 This post summarizes my past weeks on the Alaskan waters whether kayaking, white water rafting, or using the Alaska Marine Highway and its ferries. Pictured below is Chilkoot Lake or “Big Fish Lake” surrounded by the mountains creating a landscape worthy of a postcard for kayaking while spotting waterfall after waterfall, wild flowers like fireweed and lupine, and animals galore. Ironically, my guide was from Florida, but he has called Haines home for nearly five years. 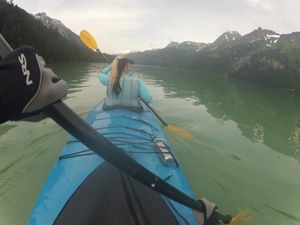 Recommended: kayak tour with pick-up from the ferry terminal with a stop prior to departure at the Haines Brewery in Dalton City, spot of the Alaska State Fair. Try from 4+ brews or even homemade root beer. My favorite is the Dalton Trail Ale. However, I’ve heard that the Spruce Tip Ale brew is awesome. The brewery was sold out on my visit. Whichever is your favorite you can take one or all home with you in a 1/2 liter growler or a full gallon growler. Boarding the raft at Skater’s cabin on Mendenhall Lake overlooking the Mendenhall Glacier, we were led by a fellow Wisconsinite down the Level 3 rapids. (Something is telling me that Floridians and Wisconsinites are following me??) We passed the campground, Clear Creek Trail, Montana Creek, and Brotherhood Bridge while witnessing the valley unfold from the mountains and glacier to the valley and its meadow of fireweed and other flowers until the river ends as it flows into the Gastineau Channel. 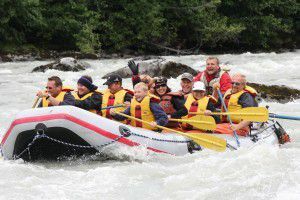 Recommended: This is a sport you can do in Juneau rain or shine. The gear will make or break the trip. Don’t skip the water boots, waders, or raincoat. They are provided by the tour. Also, they allow you to store your items, which they will transport to the end of the trip. If you are the type that gets chilly easily, bring extra socks and one dry fleece. I would not bring a camera unless you have a GoPro like myself (see photo of it mounted on my head). Alaska Tour Adventures takes action shots that are reasonably priced. It is too difficult to paddle and take photos. Also, post trip, they offer warm apple cider, cheese, reindeer sausage, crackers, and Alaskan adult beverages. Don’t miss a Alaskan Amber. You have to support the local Juneau award winning brewery! You can even tour the Brewery in Lemon Creek on your quick or extended visit of the Juneau area. This is hands down the absolute, best way to travel in Alaska. You can drive on with your car, truck, or RV, bring bikes, kayaks, or canoes, or just yourself. You spot wildlife while aboard whether you are going for just a day, camping on the top deck overnight, or sleeping in private cabins. There are various entertainment rooms as well as a dining area and lounge/bar. Vessel: Malaspina ferry equipped to carry vehicles, recreational items like bikes, kayaks, or other, and passengers. It has private sleeping cabins, upper deck solarium for lounging or camping, dining area, entertainment lounge, and bar. Recommended: Board early so that you can get the best seats. I would suggest getting a good solarium lounge chair upstairs. It is protected from the wind with heaters if chilly. The best views are from this area of the Lynn Canal. Plus, if you are traveling in a group, I would suggest a table in the inside cabin as well for journal writing, card playing, or DVD watching. If you are someone that prefers to munch and not wait in a cafeteria line, I would bring plenty of snacks. I brought fruit, trail mix, cheese, crackers, and a box of wine for the return trip. With comfort in mind, I would suggest a sleeping bag, even if you are not camping, in order to cushion the lounge chairs as well as for warmth. My last recommendation for shutterbugs or novices, bring your camera. The views of the daytime and nighttime mountaintop skyline are impressive. Check out my panoromic video of the 4+ hour journey to Haines in a compressed 1 minute video below. A special thanks to my companions on these journeys. Both Brian and Kristen were my fellow adventureros in Alaskan Adventures with Ms Traveling Pants – Part 7. Here’s to more good times and good stories in Alaska and beyond. Keep abreast of my recommendations, adventures, and more by connecting on Facebook, Twitter, Google+, and/or YouTube.